Despite having no fewer than eighteen named characters and an elaborate storyline based, albeit rather loosely, on real historical figures, Giordano’s Andrea Chénier manages to distill down to opera’s essential love triangle of the soprano, tenor and baritone. The work’s relative obscurity is not a consequence of inept writing. Not quite thirty years old when he composed it, Giordano was considered one of the most promising post-Verdians amongst the 1890s’ verismo practitioners. 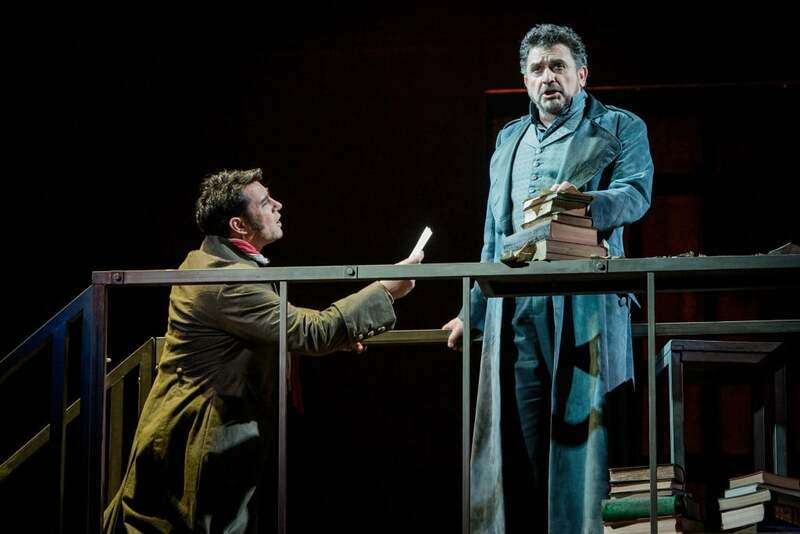 He had an inspirational librettist in Luigi Illica, whose consummate sense for the dramatic would merit his collaboration with Puccini in Bohème, Tosca and Butterfly. Here Acts II, III and IV together span barely a 24-hour period, with Act I occurring fully eight years previously, marking a sharp divide between the protagonists’ political and emotional beginnings and the people the upheavals of revolutionary France subsequently make them. 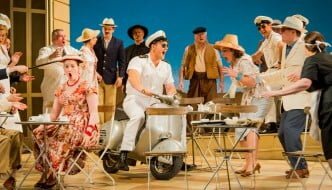 Annabel Arden’s welcome, briskly-moving production, new for Opera North, helps to lift the piece again to a more-deserved mainstream placement, dispelling an unwarranted post-war reputation it acquired for ponderous story-telling. The plot centres on the last days of the eponymous French poet, who fell from favour in the post-Revolutionary paranoia after 1789 and met his end at the guillotine. Some of Chénier’s lines, with a militaristic back track suited to the historical setting, are read out as a prologue and at scene changes as pungent commentary to the unfolding drama. Of the music, tenor Rafael Rojas, in the title role, makes much of his four big arias. His cathartic opening number, an insight into this poet’s world view, “One Day To Blue Horizons I Looked Profoundly” signs us up to his cause immediately. His voice, convincingly Italianate, an ideal romantic attribute, imparts warmth to the tender moments and an exalted energy to his outrageous treatment in the Terror. Annemarie Kremer as Maddalena de Coigny. 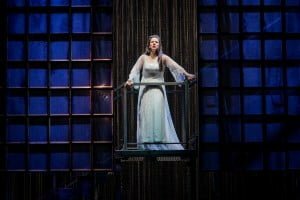 Annemarie Kremer’s Maddalena turns from the wastrel dalliance of a society dilettante to Chénier’s ardent lover. From her girlishly winning smile to the engaging, strong woman in control of her own destiny, it is a convincing characterisation. Her voice, whether in facile, brooding or frantic mode, is impressively even over a large compass, making her lower register telling and focussed with a comforting velvet quality at the top. Her Act 4 aria comes off splendidly, arousing, as it must, powerful responses, from the heart-stopping pathos of her mother’s brutal demise to the dark, vengeful anger at those who have overturned the world she cherished. Above all, the luminous love for Chénier now brightens and guides her brief future. Their final, monumental love duet lifts the roof. Carlo Gérard is Giordano’s and Illica’s finest creation here and Robert Hayward brings his formidable theatrical skill to bear in his portrayal. Encouraging immediately is his tonal transition from the venomous tirade against the heartless indifference of those of the ancien regime. This opens the opera, and the vocal softening at the first appearance of the lovely Maddalena, whom he loves from afar. Thus our understanding and sympathy are his from the start. Equally, his transformation from domestic servant with attitude to imperious Jacobin zealot is carried off with aplomb. The pivotal Act III scene when Maddalena offers her body to secure Chénier’s release has obvious parallels with that involving Tosca and Scarpia which Puccini was to write four years later and, doubtless, the latter learned much by studying its unfolding. Unlike Scarpia, Gérard retreats in his hatred towards his rival and, henceforth, commits to overturning the poet’s fortunes. His intervention at the trial is a riveting piece of theatre. Rafael Rojas as Andrea Chénier and Annemarie Kremer as Maddelena. Photo Credit: Robert Workman. Of the many minor parts, Fiona Kimm and Dean Robinson seem happier as ardent revolutionaries, Madelon and Fouquier-Tinville, than the powdered aristocratic puppets they play in the first Act. Throughout, Daniel Norman’s Incroyable is an unswervingly sinister servant for the cause. Phillip Rhodes, as Roucher, sings his Act II advice admirably and Anna Dennis, as the saintly sacrificial Bersi, makes the most of her moment. 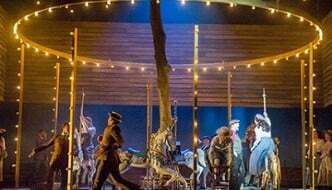 Opera North’s chorus bay for blood most musically and conductor Oliver von Dohnányi has the orchestra inspired by a score they clearly relish playing. Joanna Parker’s costumes bedeck the Countess’ soirée with colourful grotesquery, whilst fitting the Paris mob in fifty shades of grey. Only the burning city and their beloved symbolic tricolore cut through the monochrome. At the close, with only the poet’s works remaining as an on-stage legacy, Chénier and Maddalena disappear to their deaths through the dawn’s blue horizon about which he had mused so long before. 2, 20 and 24 February 2016, Leeds Grand Theatre, see Opera North website for tour details.